I was afraid of the Rainbow Rowell book, truthfully. I loved Eleanor & Park, Fangirl, and Attachments, but I’d heard that Landline was different and kinda weird. Weird in a way that most Rowell fans don’t like this book. But I dove in to Landline by Rainbow Rowell anyway because I needed to figure it out for myself. Here’s what I figured out: it is definitely weird. A phone that calls the past for only Georgie McCool is a stretch. But the themes of love and regret and marriages that might have been a mistake and two opposites finding love are things that resonate with me on a personal level so I was able to still find so much I loved in this book that I was able to look past the weird phone thing. The story is Georgie McCool, a sitcom writer, and her husband, Neal, are growing apart. Neal is a stay-at-home dad who is unhappy with the way things have turned out and Georgie has spent too much time focusing on her career and not enough time focusing on home. So when Christmas comes and Georgie backs out of the family trip to Nebraska, Neal has had enough and takes the kids and goes without her. After he’s gone, Georgie spends her time at her mom’s house in her old bedroom reliving a week of phone calls she had with Neal before they were engaged. It sounds completely ridiculous and it is. But somehow it works in the story and we care about the outcome because could it alter the future? I desperately wanted Georgie and Neal to work out–this marriage in trouble just breaks your heart–and as it nears the end, you’re just not sure it will. 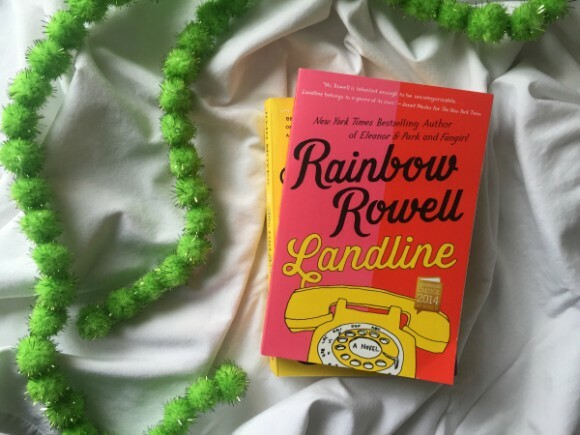 Landline by Rainbow Rowell is definitely different and a little out there, but it’s a fun read and has you hoping for happy endings in a world where we so often just give up on marriage. I liked this one. It’s weird, but I liked it. I really loved Attachments–I wish she would do another book like that! Book sista! I really liked this book. I need to check out more of her stuff! You do! Have you read Eleanor and Park? You must read it immediately if you have not. MUST. I loved Landline! I wanted to love Fangirl but for me that’s the one that fell flat. I have no interest in Carry On. I hope she publishes something else soon!